When Vic Vigoda offers Left Wright a bundle to pull off an easy heist—nothing to it, just grab an envelope out of Judge Chancellor’s bedroom safe and scram—Lefty goes for it. But he’s barely entered the room when he spots the judge’s dead body half under the bed and a snazzy Rolex on the floor nearby, and then hears the wail of sirens as two cops storm the house. Jailtime or worse looms unless San Francisco p.i. Jake Diamond (Catching Water in a Net, 2001) can figure out why Vigoda set Lefty up and who he was fronting for before electioneering DA Lowell Ryder takes the case to court. 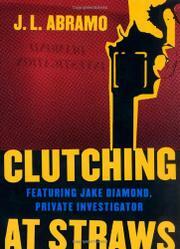 Diamond closes in on the missing envelope, the owner of that pricey Rolex, and a secret the judge was about to expose—all against a background of wisecracks from his secretary Darlene, oblique clues dropped by mob connections both in and out of the pen, a bit part in a movie featuring Ryder’s ex-con actor brother, and gobs of dough supplied by another client, finance writer Jeremy Cash, who hired him to prove whether his son Freddie engineered his own kidnapping. Before it’s over, the body count—including good old Vic and a couple of cops—rises almost as high as Diamond’s nightly bourbon consumption. Gabby, with a slew of pulp-derived complications and quirky sidekicks. Mostly for the middle-brow (and lower-brow) crowd who like to flex their retro, macho reflexes.